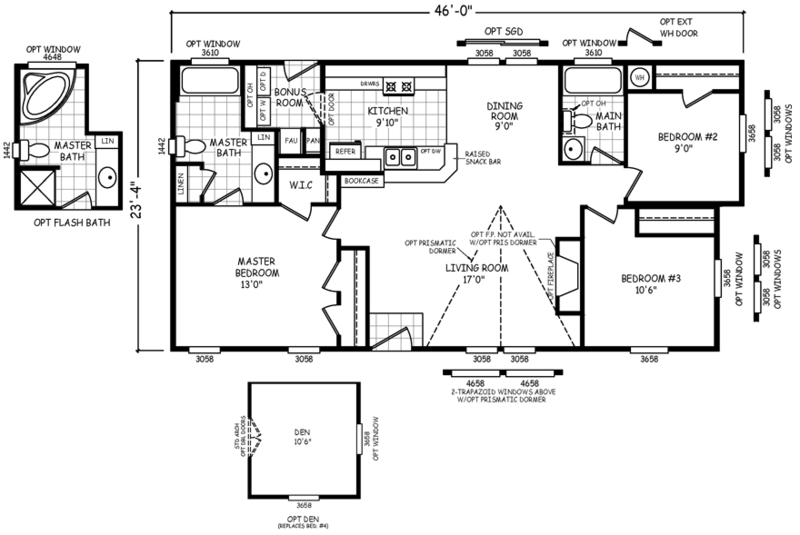 The Crestone model has 3 Beds and 2 Baths. This 1050 square foot Double Wide home is available for delivery in Arizona, California, Nevada, New Mexico, Colorado, Utah. This mid-sized home offers a great base layout, but also tremendous design flexibility. While having a formal family-room might be a great fit for some homeowners, others may see more value in opting for an additional bedroom instead. Any of these combinations are possible with the Crestone model. Ask about the optional flash bath, prismatic dormer and fireplace. If pictures are shown, they may depict upgrades and options that are not included within the base price of the home. Ask your housing consultant for details about the other great features that come standard on the Crestone manufactured home.